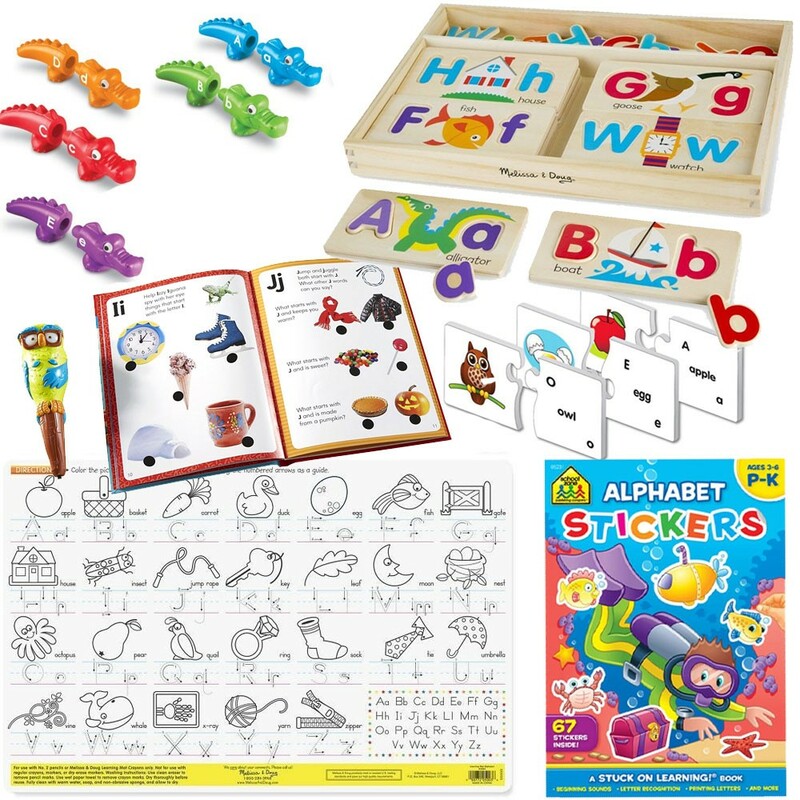 This educational kit of 6 awesome toys was designed to help preschool kids learn ABCs, uppercase and lowercase letters, and practice early reading skills. 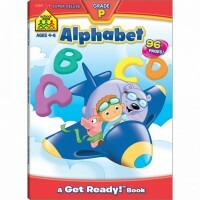 Alphabet? 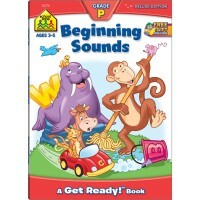 Great to get acquainted with you! Even better to know you well! 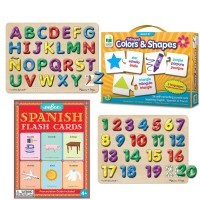 Encourage your toddlers or preschool children to recognize and love letters, learn beginning sounds, practice early reading skills with our comprehensive collection of alphabet learning games and toys. The Alphabet Learning Preschool Toys & Games Kit was hand picked by our team of professional educators as an ultimate alphabet teaching aid. 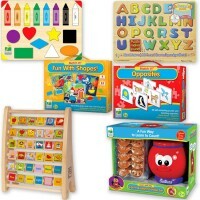 Educational Toys Planet compiled a set of 6 smart toys from the award-winning manufacturers. 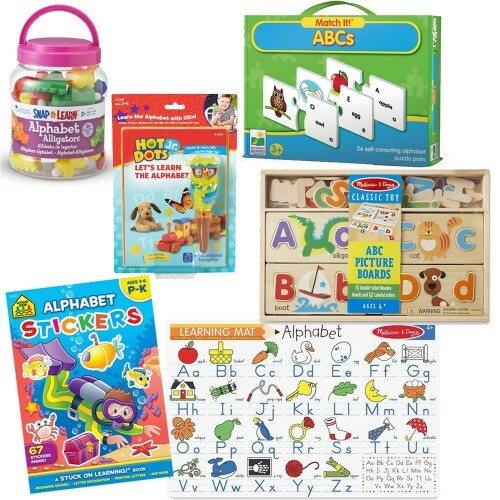 The preschool educational kit comes complete with Educational Insights' Hot Dots Jr. Let's Learn the Alphabet Interactive Book & Owl Pen Set, Melissa & Doug's ABC Picture Boards Wooden Letter Puzzle Set and Alphabet Double-Sided Learning Write-On Placemat, Learning Resources' Alphabet Alligators Uppercase & Lowercase Letter Matching Set, the Learning Journey's ABCs Match It! 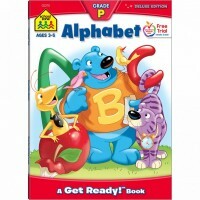 Learning Puzzle and School Zone's Alphabet Stickers Preschool Learning Activity Book. 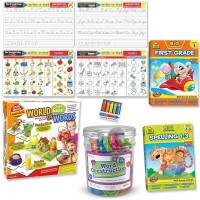 Hot Dots interactive set features a letter learning activity book and adorable talking owl shaped pen. 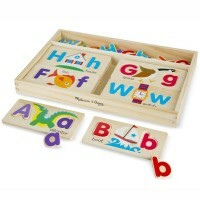 The wooden letter matching set features 65 easy-to-grasp, durable wooden puzzle pieces to find the upper- and lowercase letters. 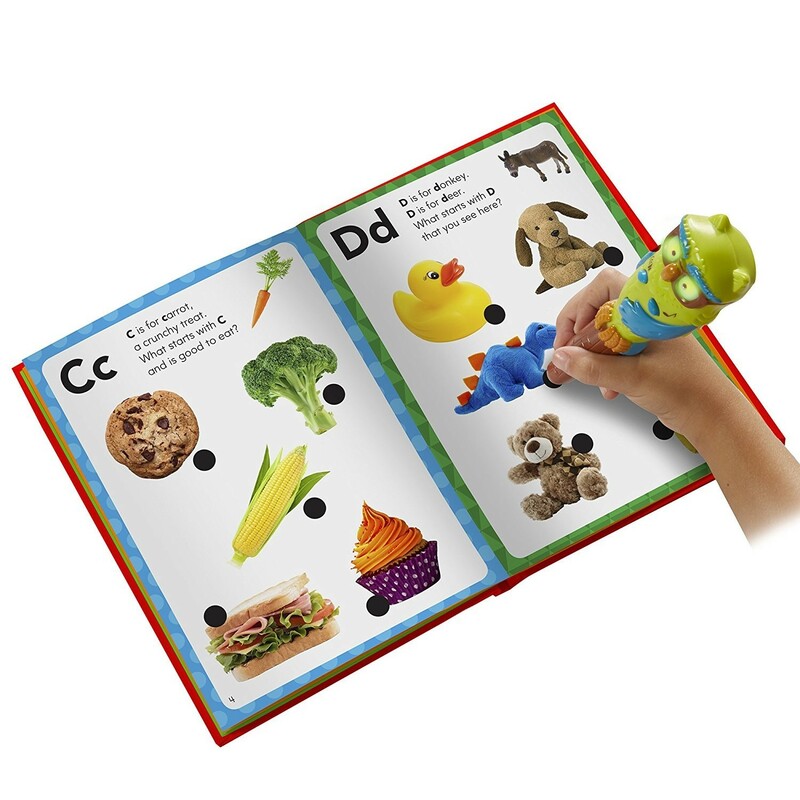 The double-sided write-on mat features ABC with uppercase and lowercase letters and kids-friendly pictures of different objects. 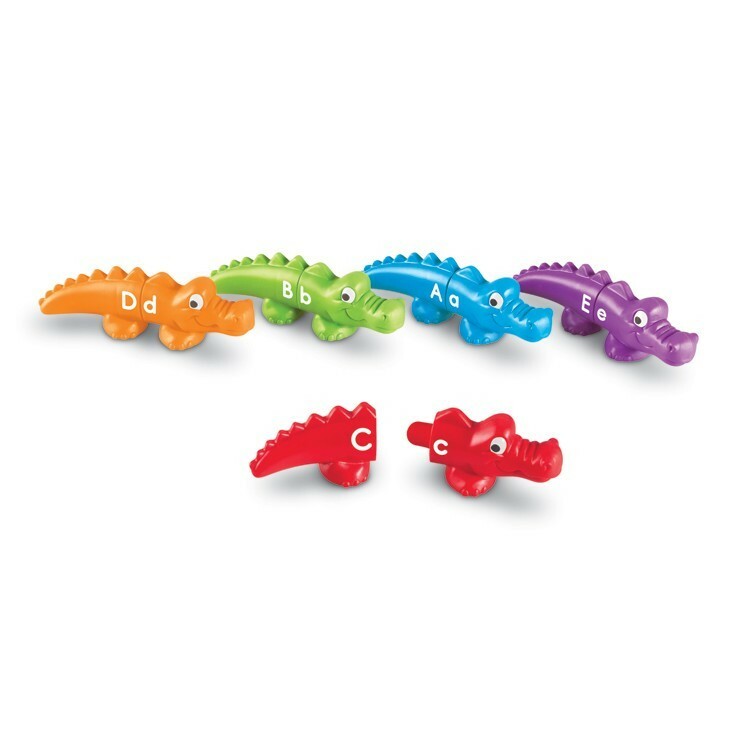 Match uppercase with lowercase letters snapping the colorful Alphabet Alligators together from this educational Snap n Learn set. 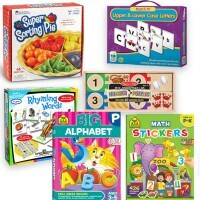 The self-correcting ABC puzzle game comes with 26 pairs of cards to help kids match up letters and first words with the pictures. 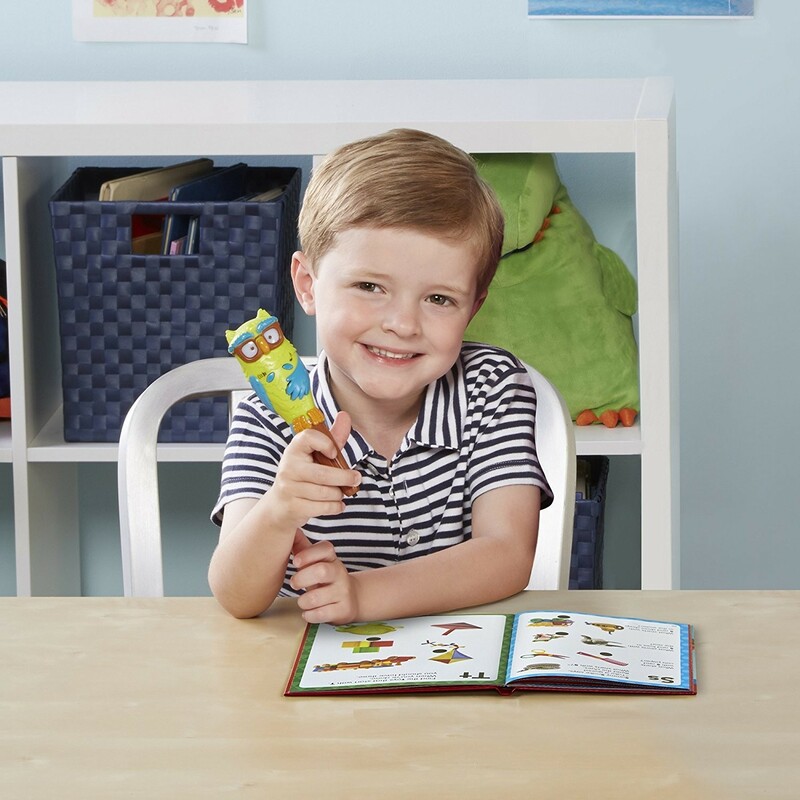 The preschool sticker activity book has activities to introduce and practice beginning sounds, letter recognition, printing letters, and more! 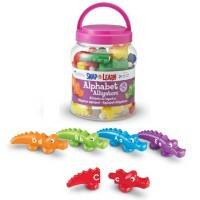 Learning the alphabet is guaranteed fun with the terrific play tools from this educational kit. 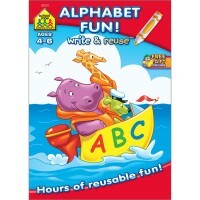 Write your own review of Alphabet Learning Preschool Toys & Games Kit.